Jan is still eating soft food, but she is getting tired of smoothies. A few weeks ago, I made a Thanksgiving chopped turkey shepherd’s pie for her brother, who is also having difficulty chewing. Today, I thought I would make a lamb version for Jan. I have always struggled with the name of this dish. 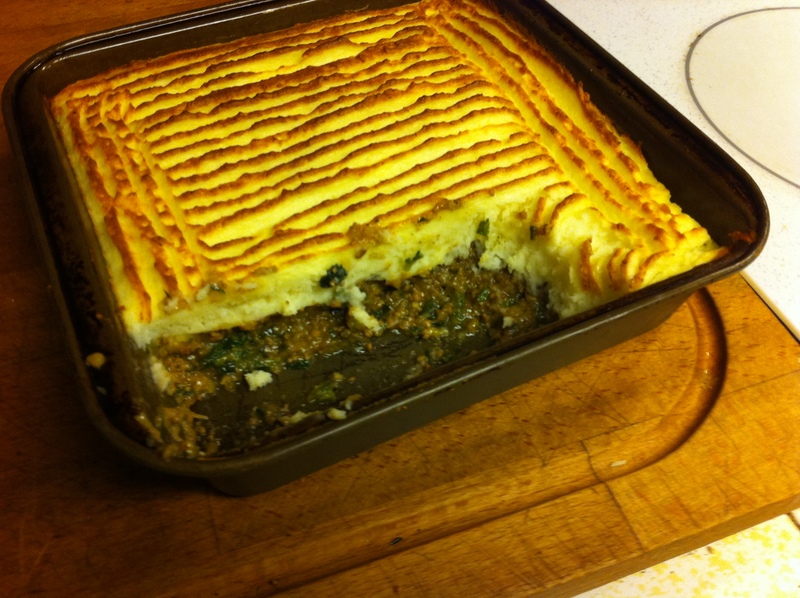 Most of the recipes I have found on-line seem to be made with beef, but wouldn’t this make it a rancher’s pie? I think that if it is not made with lamb it shouldn’t be called a “shepherd’s pie,” but I may be just funny that way. Normally, this pie is made with chunky pieces of meat in the base stew. Since I am grinding the meat into minced meat I felt that this word should be in the title, but “minced shepherd’s pie” sounds like something that you should serve “with fava beans and a nice Chianti.” However, this title sounds like it is a mincemeat pie, which is something altogether different. Oh well, nothing is perfect. To make this a soft food dish I not only started with ground meat, but I ground it a second time after I had browned it. I also ground all of the vegetables and cooked them as a paste, rather then cooking them and then blending them into a slurry. The final stew was more of an enriched gravy, rather than a chunky stew. One problem that I have had in making this dish in the past is that the mashed potatoes can sometimes be a bit dense. I wanted my potato topping to be light and fluffy. I wanted it to float on the top of the stew, not sink to the middle. Last week I made some tapioca pudding. After making the tapioca, the recipe called for folding in whipped egg whites to add air to the dense pudding. I decided that this was the perfect solution to making fluffy potatoes. It worked out perfectly. After Dinner Note: Jan commented that it felt like the first “real” meal she has had in the last week. 1. Melt two tablespoons of butter in a large pan and, over medium high heat, brown the lamb well. 2. Transfer the meat to a bowl and drain off all but two tablespoons of the fat in the pan. Tip: Reserve this fat in case you need to add some of it back as you are sautéing the vegetables. 3. When the meat has cooled, grind it again to turn it into minced meat. Note: I have a food grinder, but if you do not you may use a food processor, box grater, or knife to finely mince all of the ingredients. You want everything to be in as small of pieces as possible. 4. Grind the onions. Add them to the pan with the salt and sauté them for two minutes. Tip: The finely ground onions will cook very quickly because the individual pieces are so small. 5. Grind the carrots, celery and garlic together. Add them to the onions and continue sautéing until most of the moisture has evaporated. Tip: As the pan dries out you may need to add back some of the lamb fat. You want the vegetable paste to be picking up some color, but not sticking to the pan. 6. Stir in the thyme, rosemary, and pepper. 7. Sprinkle the flour over the vegetable paste and continue cooking for two minutes, stiring constantly. Tip: You want the flour thoroughly mixed in, and mostly cooked, to prevent lumps and a raw flour taste when you add the liquid. 8. Add the beer, or other liquid, and simmer for ten minutes, stirring occasionally. 9. While the stew is simmering, peel and chop the potatoes into a ¾ inch dice. 10. Add the potatoes to a pot with water to cover and bring it to a boil. Simmer the potatoes until tender. Tip: When a knife slides in easily to the largest pieces the potatoes are fully cooked. 11. Add the spinach to the stew and continue simmering for five more minutes. 12. Drain and mash the potatoes. Tip: Do not over work the potatoes or they will turn into glue. I use a potato ricer to get perfectly smooth potatoes. Note: I must bring up one point about using a potato ricer. If your potatoes are not completely cooked it is sometimes had to get them to go through the ricer. This is a case where it is better to have your potatoes be a little bit over cooked than under cooked. 13. Separate the egg. Put the yoke into a measuring cup and the white in a small bowl. 14. Wisk the whites until they reach the soft peak point. Tip: Whipping egg whites is a trick unto itself. If there is any water in the bowl or in the whisk, if any of the egg yolk gets into the white, they will not fluff up into a meringue. You can also over whip your egg whites and have the meringue start breaking down. Time and practice are the only teacher for this technique. 14. Add the cream to the measuring cup and beat in the egg yolk. 15. Melt the remaining two tablespoons of butter, 45 seconds in the microwave. 16. Gently whisk the cream mixture and butter into the mashed potatoes. Tip: You are just trying to get it well blended, but again do not over work the potatoes. 17. Mix one scoop of the potatoes to the egg whites and then gently fold then into the mashed potatoes. 18. Put the stew into a Pam-ed 9×9 inch deep baking pan, or a similar sized casserole. 19. Put the mashed potatoes into a gallon plastic bag and snip one corner off of the bag. Twist the open end of the bag and pipe the potatoes over the stew. Tip: You could just spoon the potatoes over the stew, but using a plastic bag is much neater and makes a more even crust. 20. Spread the potatoes out evenly with a spatula and, using a large serving fork, drag the tines of the fork over the potatoes to make decorative groves. 21. Place casserole in the oven and broil until the potatoes are golden brown and crusty, about 15-20 minutes. 22. Let the stew cool for 10 minutes before serving.